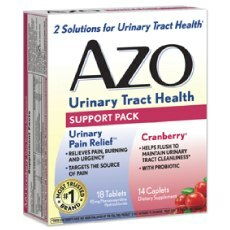 AZO Urinary Tract Health is a very convenient product which is set to contain ingredients to relieve urinary pain and it also has cranberry supplement. The product is intended to provide you with substantial relief against pain felt in your urinary system. The product is also promising that it is going to interact directly with the site which is causing the discomfort, leaving everything else unaffected. This is quite convenient. Let’s see, however, if it is actually true. The company which made the product is known as AZO Products and it is a reliable, over the counter company with a lot of products. It is one which is specialized in the production of UTI preventive products which is quite convenient. The product itself makes a few serious claims. It is intended to provide you with substantial urinary tract pressure relief and to help you get through potential infections, irritations or inflammations. Let’s see if that’s true. This is a product which is mainly predicated on the functioning of a few essential minerals, vitamins and extracts. This is something quite convenient as it will help you handle UTIs without the usage of any strong chemical compounds and ingredients which might actually be harmful for your body. This is the main reason for which we tend to believe that the composition is quite reliable and that you ought to keep it in mind. Phenozapyridine Hydrochloride – There is 95 mg of this and it is going to deliver serious relief against unpleasant urinary discomfort. Vitamin C – This is a very important vitamin which is known to strengthen the functioning of your systems, including your urinary tract. Calcium – This is a powerful mineral which has a range of different benefits. Pacran Natural Cranberry Powder – This is the ingredient which is going to enhance the functioning of your tract and it would prevent inflammation. Bacillus Coagulans – This is going to provide you with overall benefits and it will help you handle UTIs. AZO Urinary Tract Health Review – Does It Really Work? There are quite a lot of negative reviews. This is the main reason for which making a conclusion of the kind would be incredibly inappropriate. It could help your urinary tract. It comes with powerful ingredients. The company may be very reliable. There are quite a lot of very negative reviews. The product doesn’t make a great resonance within the community. You should only use this product after carefully reading the instructions which are set forth by the manufacturer. What Are The Precautions When Using This Supplement? This is a product for people who don’t experience any serious health issues. If you do, make sure to check it by your physician first. The pain relief promised by the company is actually instant. No side effects are associated with the usage of the product. However, some people report stomach irregularities. All in all, this seems like something that you might be able to take advantage of if you have issues with your urinary tract. It is a reliable product brought to you by a leading company in the field. This is something to account for. On the other hand, there are a few setbacks. There are a lot of negative reviews that you would have to consider. The ingredients might be a bit too powerful, causing quite a lot of additional consequences as well. Make sure to find something more established and effective on the market.